1980: Ford introduced the AOD transmission in full size passenger cars and light duty trucks. This was a hydraulic transmission with throttle cable and governor. 1993: (half year, Depending on month produced you could have hydraulic or computer controlled ford transmission) they introduced the AODE which is the same transmission with electronic controls. 1993: also brought us the 4R70W Transmission which is the same as an AODE Transmission except for a lower 1st and 2nd gear ratios as well as higher overdrive ratio for fuel economy. 2003: Ford upgraded the 4R70W transmission which has an improved ring gear and pump assembly for durability, and added VSS as well as output sensor. They also modified it again calling it the 4R75W/4R75E Transmission which is basically the same as the 4R70W except has an input sensor for the TCM to deal with fly-by-wire throttle controls. Technical information for Ford 4R70W and 4R75W Transmissions including harness connector pin identification and pressure testing specifications. The Torque converter clutch shuddering on a 4R70W transmission is a common complaint and can be caused by deteriorated fluid, sometimes simply changing the fluid and filter can remedy this problem. You can check the Bypass clutch control valve and sleeve, there are replacements available thru Sonnax. Be sure to use only MerconV fluid or you can create a shudder. If you change the fluid and pan was clean and you still have shudders then may be the stator bushings are worn badly and or the TCC clutch in the torque converter. Complaint: 4R70W transmission Neutrals out During 3-4 upshift. Cause: This can be caused by the 4th band servo snap ring has broken into small pieces and worked its way thru the valve body and into the Overdrive servo regulator valve jamming the valve open, when this transmission goes into 4th gear or overdrive the forward clutch releases and if you have no servo apply due to jammed valve you end up with a neutral condition. To repair this condition, remove valve body and replace front 4th servo snap ring with new. 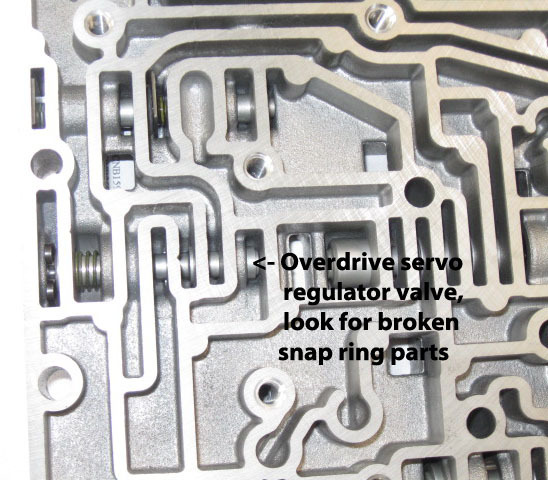 make sure you get all the broken parts of snap ring out of the valve, and all of valve body cavities. If you dont you can have a repeat of the same of worse weve seen snap ring parts go into the pump and destroy the gears and converter hub. IMPORTANT: you cannot let the servo fall out of the case! you will drop the band and have no 4th, this cannot be fixed without removing the transmission and pump to reposition the band! when you remove snap ring you need to hold servo in with screw jack or fixture, there's a heavy spring under and it will fly out, if snap ring ends are both broken off you can drill one broken end with small drill so you can use pick etc to pry snap ring out. Complaint: 4R70W transmission Neutrals out After 3-4 upshift. Cause: This was a common problem with earlier models with the shift solenoids mechanically sticking or weak , will shift 3-4 and then neutral out, will sometimes have to stop vehicle completely to to get forward movement back. If vehicle simply neutrals out when it shifts see the bulletin above. remove pan and if clean of debris you can change the shift solenoid assembly and remedy this problem. Complaint: 4R70W no 2-3 upshift. Cause: Most common cause here is the splines inside the direct drum have stripped out due to wear. check the spline inside the drum that the small shaft go into and replace drum as necc. good idea on any rebuild to install new drum if any wear is found so it wont be back soon. If you get a 2-3 shift but slips then your direct clutches are slipping, stripped splines will cause no 2-3 shift at all, will stay in 2nd gear all day. Complaint: 4R70W locked up, severe noises, stalls engine when put into gear, wont roll forwards or backwards when pushed. Cause: The Torrington bearings like to wipe out and then get into the gear train and cause catastrophic destruction of the planetary and rear section of the trans, can cause engine stalling and you may not be able to even push the vehicle forward or backwards and have to remove the drive shaft to roll. This is due to the fact that this is a car transmission that's being overloaded in a truck application and wipes out the bearings from the load. Replace all bearings on any overhaul to prevent this from happening later. For some reason unknown to mankind Ford has decided that they can put this transmission into an F-250 and even and E-350 van, which will work, just for how long? it was designed for a Crown-Victoria, not to tow your camper with an F-250 truck up mountains. If you want to tow and work a ford truck make sure you get the heavy 250, not the light duty version, you'll get a 4R100 up till 2004 and 5R110W after 2005. The van seems another story as we said the E-350 can come with this 4R75W transmission. Complaint: 2004 and up: Very slow speedometer and codes P0720 or P0722 VSS (After rebuild only). Cause: After rebuild speedometer is reading very slow, gear set was replaced during overhaul, In 2004 Ford changed the rear ring gear by extending the park lugs to replace the holes the speed sensor used to read from. If during the overhaul the ring gear was replaced with an earlier version you will have this problem. You can create the opposite by installing a later ring gear in an earlier unit. The speed sensor also was changed for model year 2004. Complaint: Ford trucks and cars with 4R70W leaking around mount area on rear extension housing. Cause: The rear tail housing may be leaking in the area of the transmission mount, above the cross member, You will likely find cracks in the tail housing by the mount pads. This is almost always caused by the build up of corrosion between the mount and housing. You will need a new housing and be sure to clean corrosion from the mount. It can be a good idea to check by removing your transmission mount before you have a leak and clean any corrosion away with grinder etc to prevent the cracking and leaking. Complaint: Slips in forward and or all gears badly, all clutches burnt. 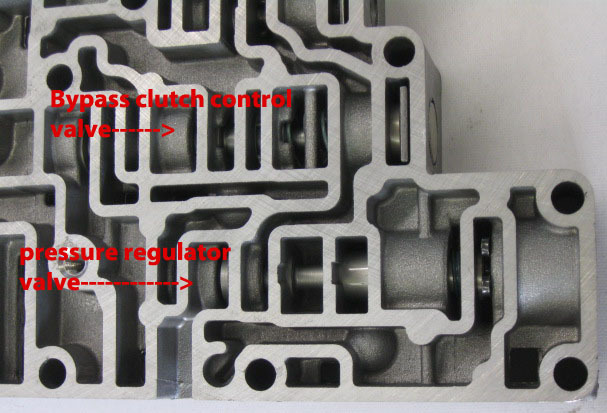 1) The pressure regulator valve bore may be worn out badly as well as the boost valve and sleeve. if the main valve and body are worn then you'll need a replacement valve body or there are reamer sets available thru Sonnax along with oversize valves. 2) The EPC solenoid may be faulty. 3) The Mass airflow sensor in the vehicle may be faulty which will command low pressure to transmission. You may or may not have any trouble codes for the Mass air flow sensor, and the only way to test may be to replace with a new sensor. You can test this issue by unplugging the Mass air flow sensor and then drive the truck, if you problem goes away and the trans feels better or firm shifting your problem is not in transmission but in the mass air flow sensor. By unplugging the sensor the TCM is setting a base value while missing the sensor signal. You will now have sensor code in memory. 4) The pump can be worn out causing low pressure in transmission.